EBITDA stands for Earnings Before Interest, Taxes, Depreciation, and Amortization and is a metric used to evaluate a company’s operating performance. It can be seen as a proxy for cash flowCash FlowCash Flow (CF) is the increase or decrease in the amount of money a business, institution, or individual has. In finance, the term is used to describe the amount of cash (currency) that is generated or consumed in a given time period. There are many types of CF from the entire company’s operations. 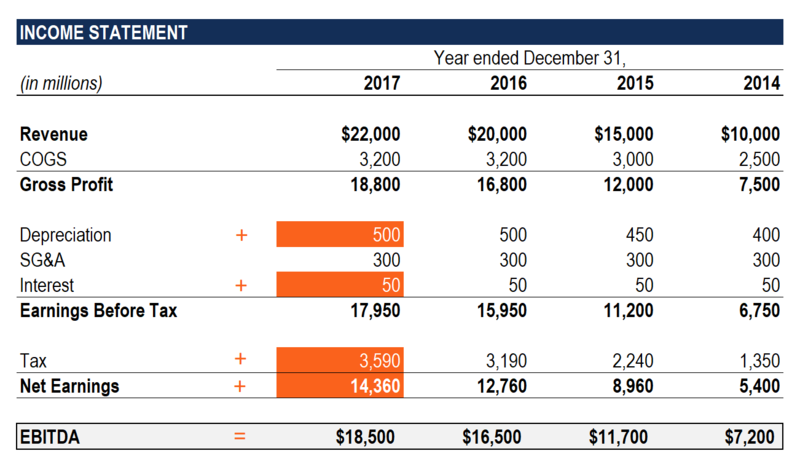 The EBITDA metric is a variation of operating income (EBITEBIT GuideEBIT stands for Earnings Before Interest and Taxes and is one of the last subtotals in the income statement before net income. EBIT is also sometimes referred to as operating income and is called this because it's found by deducting all operating expenses (production and non-production costs) from sales revenue.) because it excludes non-operating expenses and certain non-cash expenses. The purpose of these deductions is to remove the factors that business owners have discretion over, such as debt financing, capital structure, methods of depreciationDepreciation ExpenseDepreciation expense is used to reduce the value of plant, property, and equipment to match its use, and wear and tear over time. Depreciation expense is used to better match the expense of a long-term asset to the revenue it generates., and taxes (to some extent). It can be used to showcase a firm’s financial performance without accounting for its capital structure. EBITDA focuses on the operating decisions of a business because it looks at the business’ profitabilityNet IncomeNet Income is a key line item, not only in the income statement, but in all three core financial statements. While it is arrived at through the income statement, the net profit is also used in both the balance sheet and the cash flow statement. from its core operations before the impact of capital structure, leverage and non-cash items like depreciation are taken into account. It is a non-GAAP metric in that it is not a recognized metric in use by IFRSIFRS StandardsIFRS standards are International Financial Reporting Standards (IFRS) that consist of a set of accounting rules that determine how transactions and other accounting events are required to be reported in financial statements. They are designed to maintain credibility and transparency in the financial world or US GAAP. In fact, certain investors like Warren Buffet have a particular disdainWarren Buffett - EBITDAWarren Buffett is well known for disliking EBITDA. Warren Buffett is credited for saying “Does management think the tooth fairy pays for CapEx?" for this metric, as it does not account for the depreciation of a company’s assets. For example, if a company has a large amount of depreciable equipment (and thus a high amount of depreciation expense), then the cost of maintaining and sustaining these capital assets is not captured. InterestInterest ExpenseInterest expense arises out of a company that finances through debt or capital leases. Interest is found in the income statement, but can also be calculated through the debt schedule. The schedule should outline all the major pieces of debt a company has on its balance sheet, and calculate interest by multiplying the is excluded from EBITDA, as it depends on the financing structure of a company. It comes from the money it has borrowed to fund its business activities. Different companies have different capital structuresCapital StructureCapital Structure refers to the amount of debt and/or equity employed by a firm to fund its operations and finance its assets. The structure is typically expressed as a debt-to-equity or debt-to-capital ratio. Debt and equity capital are used to fund a business’ operations, capital expenditures, acquisitions,, resulting in different interest expenses. Hence, it is easier to compare the relative performance of companies by adding back interest and ignoring the impact of capital structure on the business. Note that interest payments are tax deductible, meaning corporations can take advantage of this benefit in what is called a corporate tax shieldTax ShieldA Tax Shield is an allowable deduction from taxable income that results in a reduction of taxes owed. The value of these shields depends on the effective tax rate for the corporation or individual. Common expenses that are deductible include depreciation, amortization, mortgage payments and interest expense. TaxesAccounting For Income TaxesIncome taxes and its accounting is a key area of corporate finance. Having a conceptual understanding of accounting for income taxes will allow a company to to maintain financial flexibility. Tax is an intricate field to navigate and often confuses even the most skilled analysts. vary and depend on the region where the business is in operating in. Taxes are an expense of a business that must be paid to the government in the jurisdiction of the company. They are a function of tax rules, which are not really part of assessing a management team’s performance, and thus many financial analystsFMVA™ CertificationThe Financial Modeling & Valueation Analyst (FMVA)™ accreditation is a global standard for financial analysts that covers finance, accounting, financial modeling, valuation, budgeting, forecasting, presentations, and strategy. prefer to add them back when comparing businesses. DepreciationDepreciation ExpenseDepreciation expense is used to reduce the value of plant, property, and equipment to match its use, and wear and tear over time. Depreciation expense is used to better match the expense of a long-term asset to the revenue it generates. and amortization (D&A) depend on the historical investments the company has made and not on the current operating performance of the business. Companies invest in long-term fixed assetsLong Term AssetsLong term assets are assets that a company uses in its production process, and typically have a useful life of more than one year. Such assets can also be (such as buildings or vehicles) that lose value due to wear and tear. The depreciation expense is based on a portion of the company’s tangible fixed assets deteriorating. 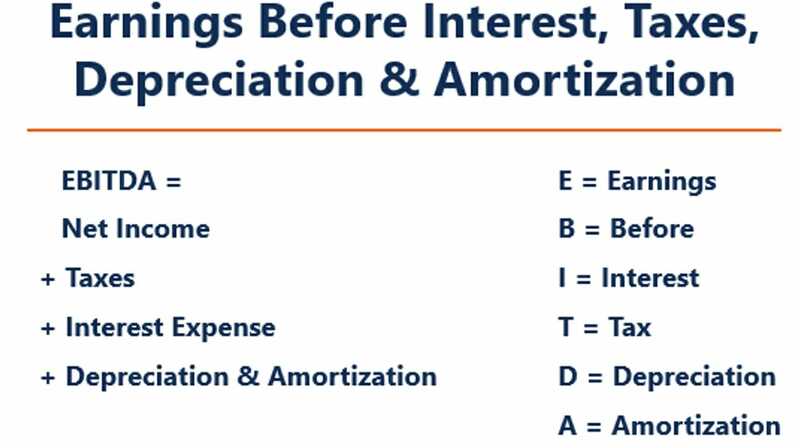 Amortization expense is incurred if the asset is intangible. Intangible assetsIntangible AssetsAccording to the IFRS, intangible assets are identifiable, non-monetary assets without physical substance. Like all assets, intangible assets are those that are expected to generate economic returns for the company in the future. As a long-term asset, this expectation extends for more than one year such as patents are amortized because they have a limited useful life (competitive protection) before expiration. D&A is heavily influenced by assumptions regarding useful economic life, salvage value,Salvage ValueSalvage value is the estimated amount that an asset is worth at the end of its useful life. Salvage value is also known as scrap value or residual value, and is used in calculating depreciation expense. The value depends on how long the company expects to use the asset and how hard the asset is used. For example, if a and the depreciation methodDepreciation MethodsThe most common types of depreciation methods include straight-line, double declining balance, units of production, and sum of years digits. There are various formulas for calculating depreciation of an asset used. Because of this, analysts may find that operating income is different than what they think the number should be, and therefore D&A is backed out of the EBITDA calculation. The D&A expense can be located in the firm’s cash flow statement under the cash from operating activitiesOperating Cash FlowOperating Cash Flow (OCF) is the amount of cash generated by the regular operating activities of a business in a specific time period. The operating cash flow formula is net income (form the bottom of the income statement), plus any non-cash items, plus adjustments for changes in working capital section. 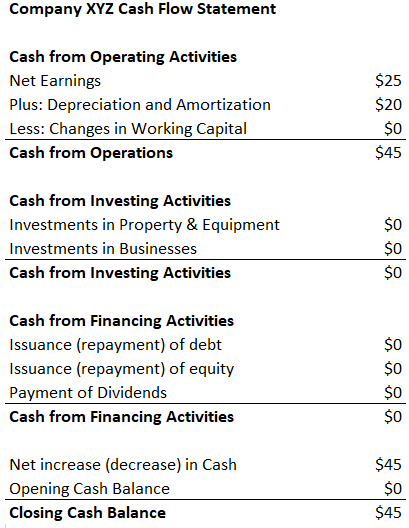 Since depreciation and amortization is a non-cash expenseNon Cash ExpensesNon cash expenses appear on an income statement because accounting principles require them to be recorded despite not actually being paid for with cash. The most common example of a non cash expense is depreciation, where the cost of an asset is spread out over time, it is added back (the expense is usually a positive number for this reason) while on the cash flow statement. 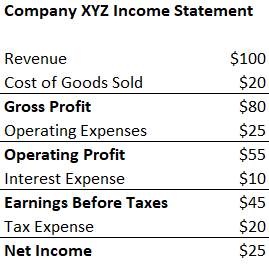 Example: The depreciation and amortization expense for XYZ is $20. The EBITDA metric is commonly used as a proxy for cash flowCash FlowCash Flow (CF) is the increase or decrease in the amount of money a business, institution, or individual has. In finance, the term is used to describe the amount of cash (currency) that is generated or consumed in a given time period. There are many types of CF. It can give an analyst a quick estimate of the value of the company, as well as a valuation range by multiplying it by a valuation multipleEBITDA MultipleThe EBITDA multiple is a financial ratio that compares a company's Enterprise Value to its annual EBITDA. This multiple is used to determine the value of a company and compare it to the value of other, similar businesses. A company's EBITDA multiple provides a normalized ratio for differences in capital structure, obtained from equity research reportsEquity Research ReportAn equity research report is a document prepared by an analyst that provides a recommendation for investors to buy, hold, or sell shares of a company., industry transactions, or M&AMergers Acquisitions M&A ProcessThis guide takes you through all the steps in the M&A process. Learn how mergers and acquisitions and deals are completed. In this guide, we'll outline the acquisition process from start to finish, the various types of acquirers (strategic vs. financial buys), the importance of synergies, and transaction costs. In addition, when a company is not making a profitNet IncomeNet Income is a key line item, not only in the income statement, but in all three core financial statements. While it is arrived at through the income statement, the net profit is also used in both the balance sheet and the cash flow statement., investors can turn to EBITDA to evaluate a company. Many private equity firms use this metric because it is very good for comparing similar companies in the same industry. Business owners use it to compare their performance against their competitors. EBITDA is not recognized by GAAP or IFRSIFRS StandardsIFRS standards are International Financial Reporting Standards (IFRS) that consist of a set of accounting rules that determine how transactions and other accounting events are required to be reported in financial statements. They are designed to maintain credibility and transparency in the financial world. Some are skeptical (like Warren BuffettWarren Buffett - EBITDAWarren Buffett is well known for disliking EBITDA. Warren Buffett is credited for saying “Does management think the tooth fairy pays for CapEx?") of using it because it presents the company as if it has never paid any interest or taxes, and it shows assets as having never lost their natural value over time (no depreciation or Capital ExpendituresCapital ExpendituresCapital expenditures refer to funds that are used by a company for the purchase, improvement, or maintenance of long-term assets to improve the efficiency deducted). For example, a fast-growing manufacturing company may present increasing sales and EBITDA year over year (YoYYoY (Year over Year)YoY stands for Year over Year and is a type of financial analysis that's useful when comparing time series data. Analysts are able to deduce changes in the quantity or quality of certain business aspects with YoY analysis. In finance, investors usually compare the performance of financial instruments on). To expand rapidly, it acquired many fixed assets over time and all were funded with debt. Although it may seem that the company has strong top-line growth, investors should look at other metrics as well, such as capital expenditures, cash flow, and net income. Below is a short video tutorial of Earnings Before Interest, Taxes, Depreciation, and Amortization. The short lesson will cover various ways to calculate it and provide some simple examples to work through. Video: CFI Financial Analyst Training ProgramFMVA™ CertificationThe Financial Modeling & Valueation Analyst (FMVA)™ accreditation is a global standard for financial analysts that covers finance, accounting, financial modeling, valuation, budgeting, forecasting, presentations, and strategy. . When comparing two companies, the Enterprise Value/EBITDA ratioEV/EBITDAEV/EBITDA is used in valuation to compare the value of similar businesses by evaluating their Enterprise Value (EV) to EBITDA multiple relative to an average. 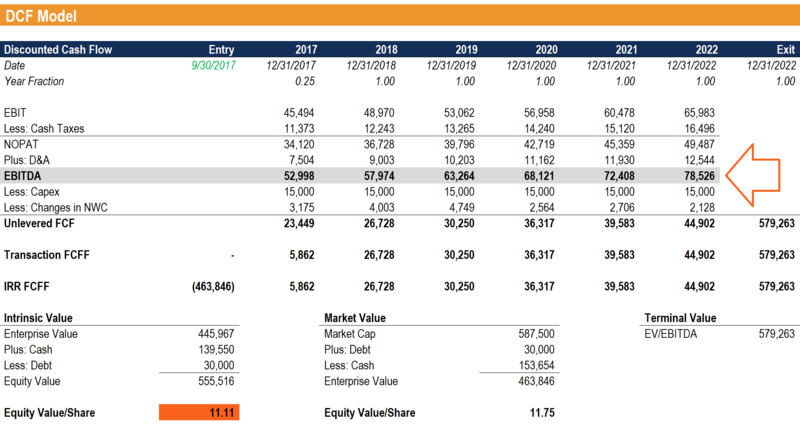 In this guide, we will break down the EV/EBTIDA multiple into its various components, and walk you through how to calculate it step by step can be used to give investors a general idea of whether a company is overvalued (high ratio) or undervalued (low ratio). It’s important to compare companies that are similar in nature (same industry, operations, customers, margins, growth rate, etc.) as different industries have vastly different average ratios (high ratios for high-growth industries, low ratios for low-growth industries). The metric is widely used in business valuationValuation MethodsWhen valuing a company as a going concern there are three main valuation methods used: DCF analysis, comparable companies, and precedent transactions. These methods of valuation are used in investment banking, equity research, private equity, corporate development, mergers & acquisitions, leveraged buyouts and finance and is found by dividing a company’s enterprise value by EBITDA. Company ABC and company XYZ are competing grocery stores that operate in the New York. ABC has an enterprise value of $200M and an EBITDA of $10M, while firm XYZ has an enterprise valueEnterprise ValueEnterprise Value, or Firm Value, is the entire value of a firm equal to its equity value, plus net debt, plus any minority interest, used in valuation. It looks at the entire market value rather than just the equity value, so all ownership interests and asset claims from both debt and equity are included. of $300M and an EBITDA of $30M. Which company is undervalued on an EV/EBITDA basis? On an EV/EBITDA basis, company XYZ is undervalued because it has a lower ratio. EBITDA is used frequently in financial modelingWhat is Financial ModelingFinancial modeling is performed in Excel to forecast a company's financial performance. Overview of what is financial modeling, how & why to build a model. A 3 statement model links income statement, balance sheet, and cash flow statement. More advanced types of financial models are built for valuation, plannnig, and as a starting point for calculating un-levered free cash flow. Earnings before interest, taxes, depreciation and amortization is such a frequently referenced metric in finance that it’s helpful to use it as a reference point, even though a financial model only values the business based on its free cash flowFree Cash Flow (FCF)Free Cash Flow (FCF) measures a company’s ability to produce what investors care most about: cash that's available be distributed in a discretionary way. Image: CFI’s video-based financial modeling courses. Company XYZ’s depreciation and amortization expense are incurred from using their machine that packages the candy they sell. They pay 5% interest to debtholders and have a tax rate of 50%. What is XYZ’s Earnings Before Interest Taxes Depreciation and Amortization? *Note: net income can also be found in the Cash Flow Statement, above the depreciation and amortization expense. 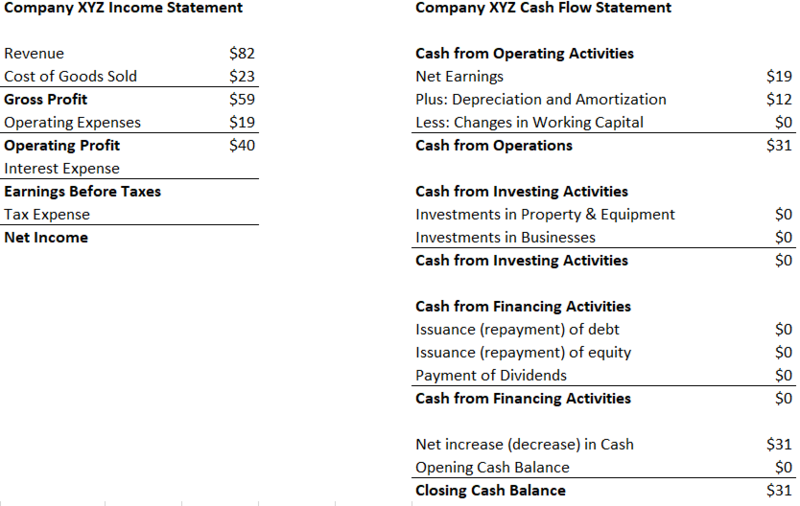 In the Statement of Cash FlowsStatement of Cash FlowsThe Statement of Cash Flows is one of the 3 key financial statements that reports the cash generated and spent during a specific time period, it acts as a bridge between the income statement and balance sheet, the expense is listed as $12. Since the expense is attributed to the machines that package their candy (the depreciating asset directly helps with producing inventory), the expense will be a part of their cost of goods sold (COGS)Cost of Goods Sold (COGS)Cost of Goods Sold (COGS) measures the “direct cost” incurred in the production of any goods or services. It includes material cost, direct labor cost, and direct factory overheads, and is directly proportional to revenue. As revenue increases, more resources are required to produce the goods or service. COGS is often.